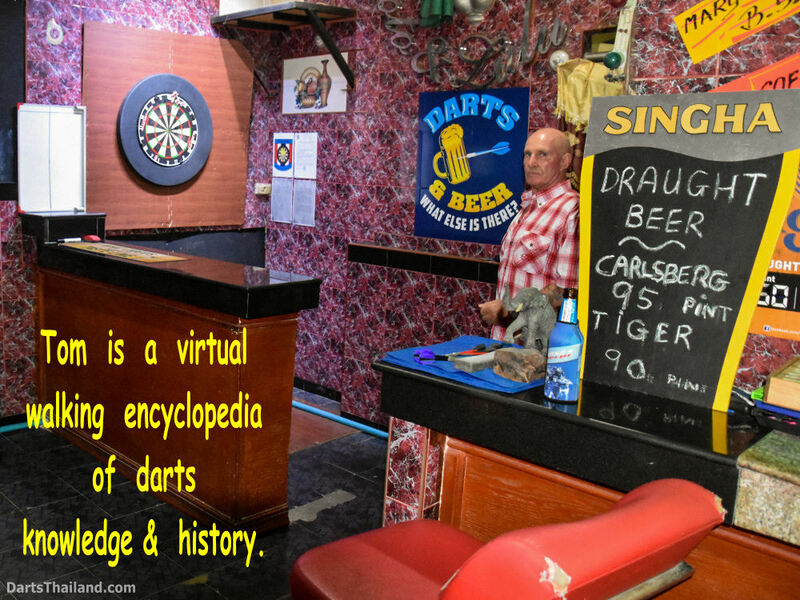 Greetings dart players worldwide. 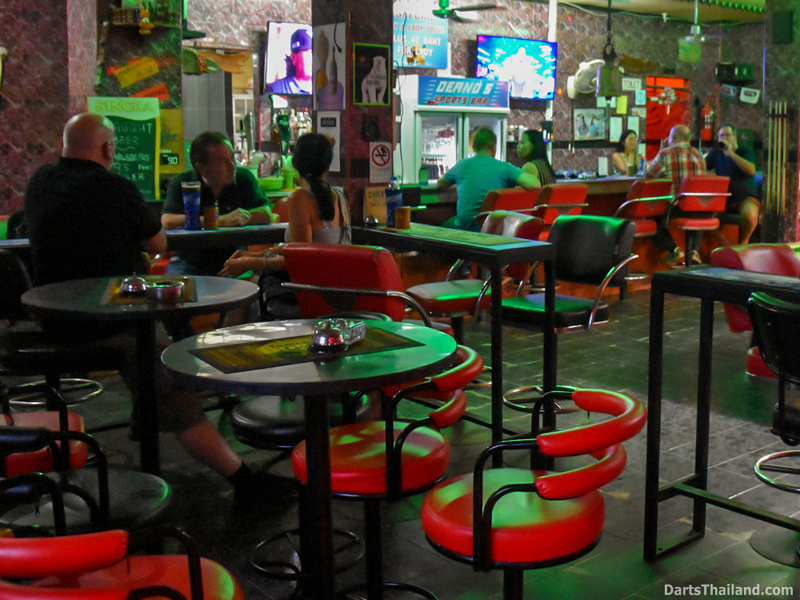 It’s our pleasure to bring you DT’s second feature of dart bars found in Jomtien Beach – Deano’s Bar. 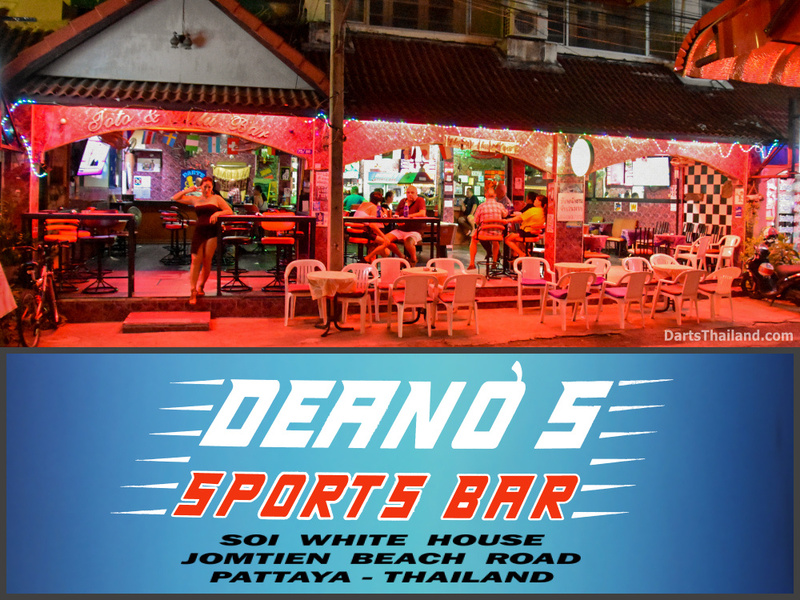 Also found on Soi White House off Beach Road – Deano’s Bar is just a few shops away from our earlier featured bar – Big Mama’s Bar. 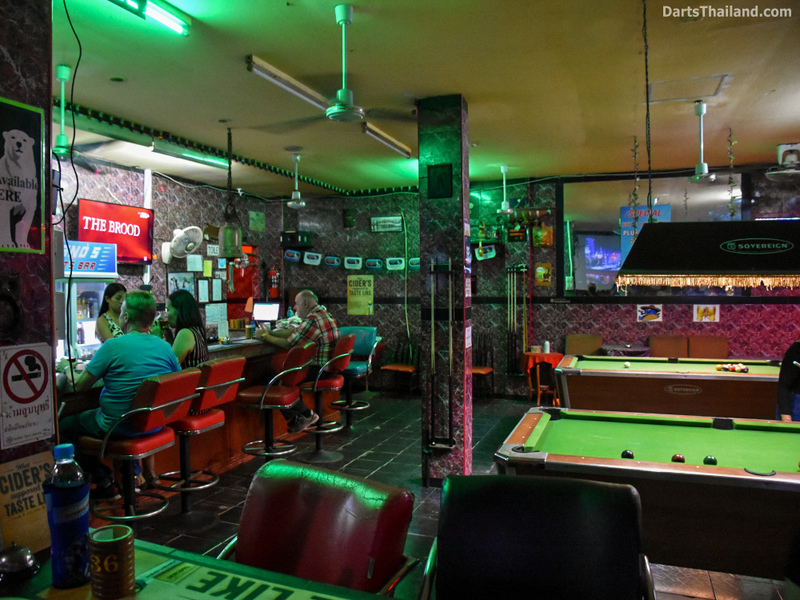 Deano’s Bar is run by the affable publican – Dean. 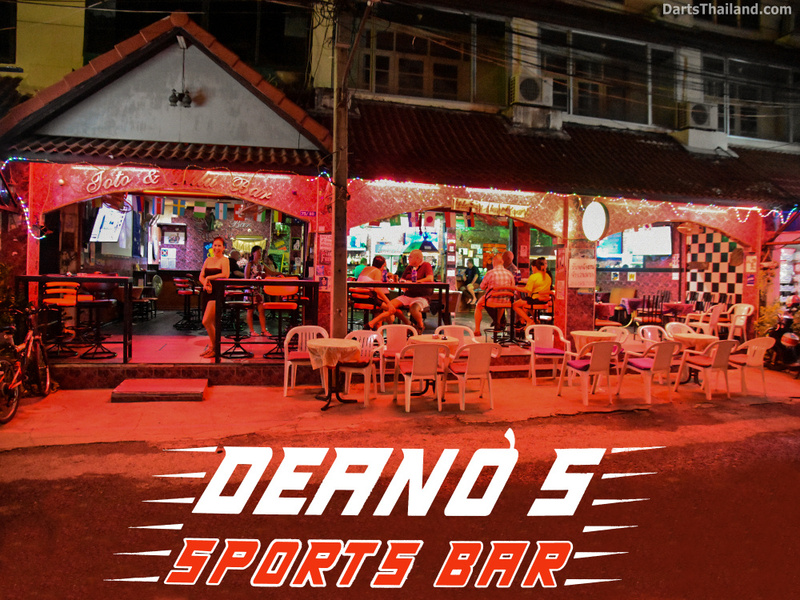 If you’re a fan of sports – then Deano’s more than lives up to its name with all the major events on their many large screens. 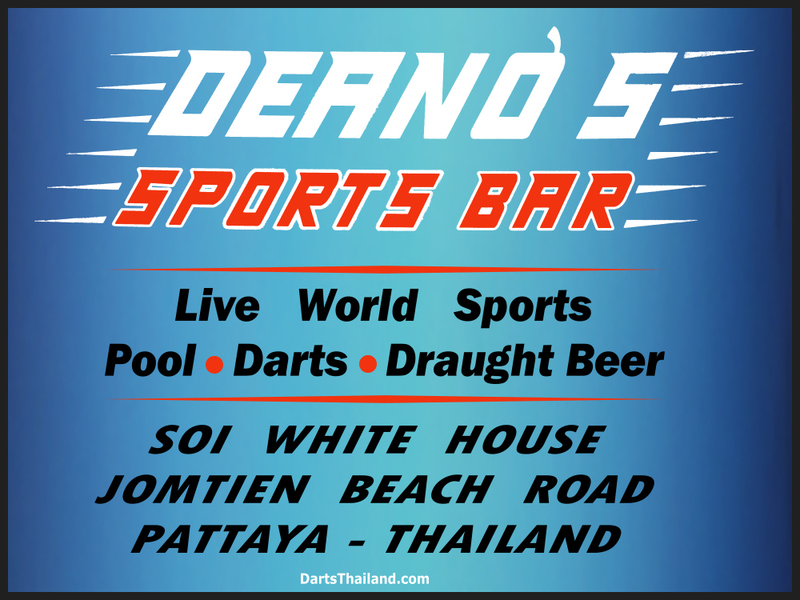 A regularly updated schedule of Deano’s televised sported events can be found on their FaceBook page – link found at the end of this article. 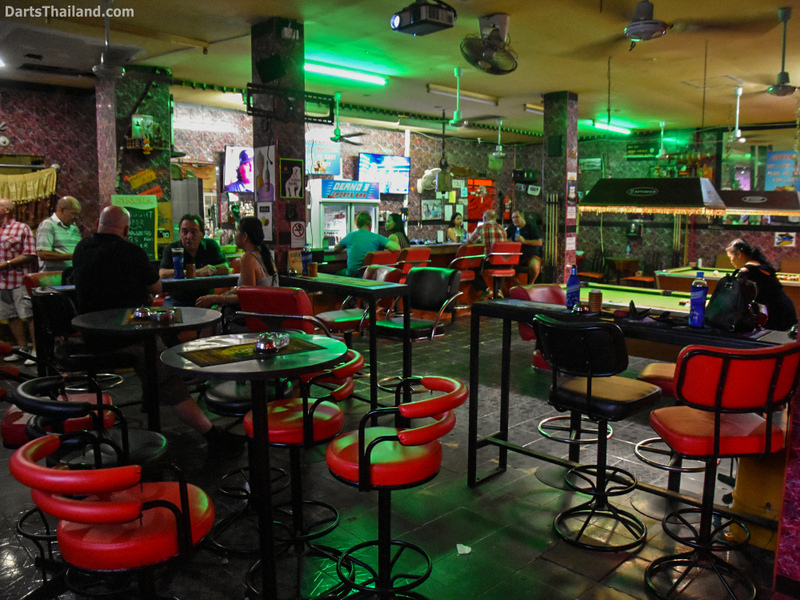 The bar also sports two pool tables for you pool sharks. 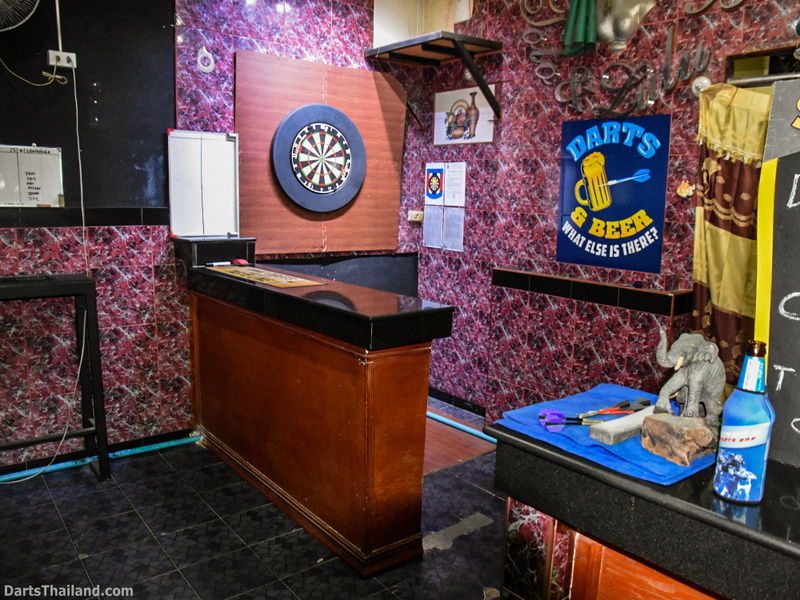 Last but certainly not least – Deano’s darts throw area. I’m always impressed with a dart throw area that has little or no possibility for non-dart playing customers interfering with or walking into the shooters throw area. Common sense is not so common with some people – some totally oblivious to their surroundings and walking into a dart throw area. As you can see in the accompanying photos – you’ve got a totally protected throw area here. 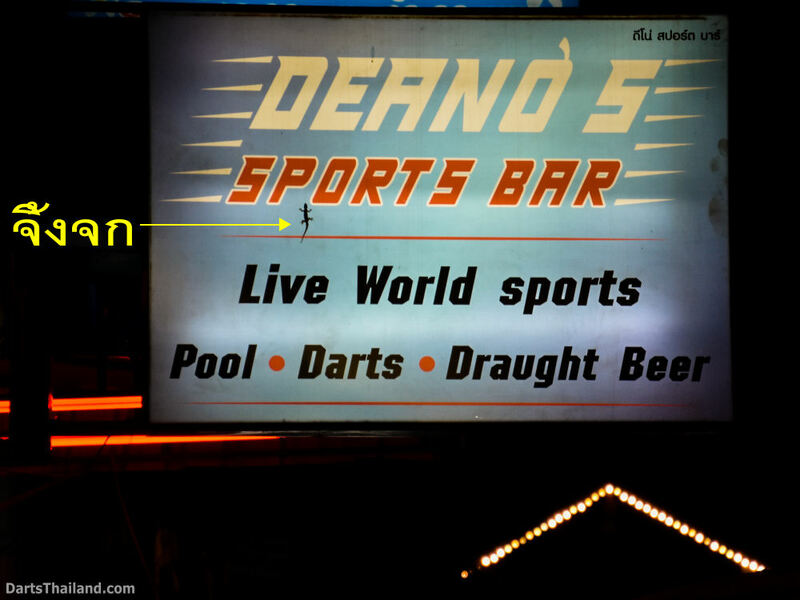 Deano’s has an active darts team playing in a league. Interested players should inquire at the bar. 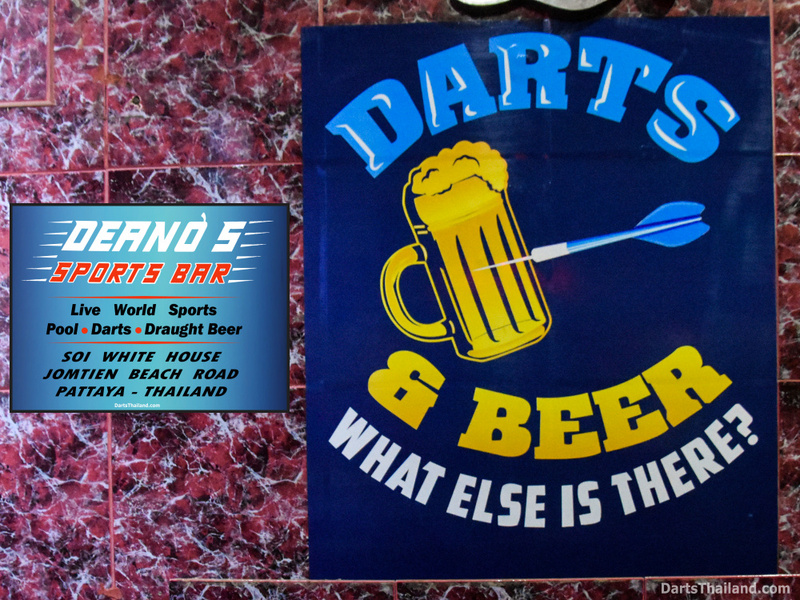 Another observation that I definitely consider a positive one at both these Soi White House darts venues – Big Mama & Deano’s – no electronic scoring machines. 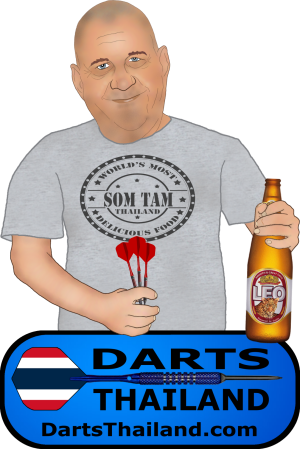 These seemed to be in most or all darts venues in the Pattaya / Jomtien area years ago. I am not at all a fan of these for many reasons. Most importantly – without ever scoring yourself (actually doing the maths) you’ll never learn your out numbers. Additionally if you’re totally inept at using such devices – as I am – making a mistake on entering a score on the keyboard requires someone who know how to make a correction on the machine. Nitpicking? No as this correction procedure halts the flow of the game. Give me a white board & marker any day ! 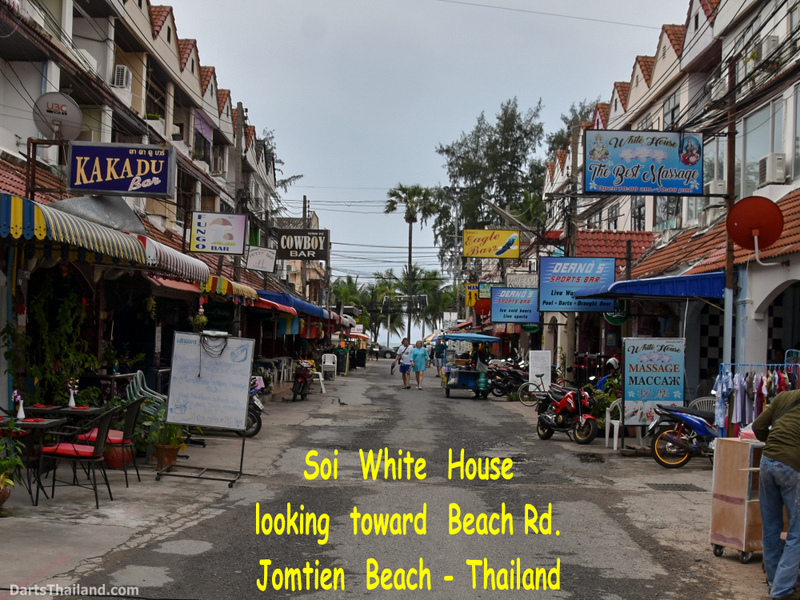 Got one more Jomtien dart venue remaining in this report series – stay tuned. 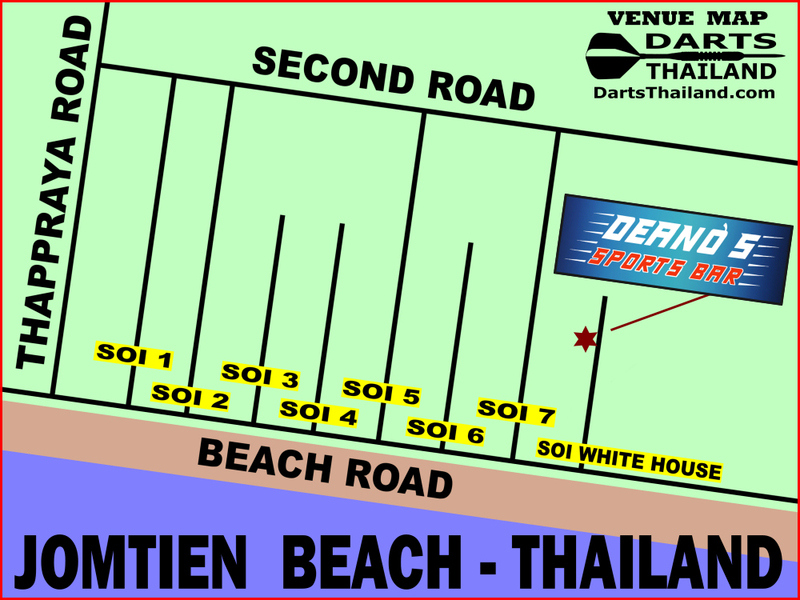 We will be returning to feature all known darts bars in Jomtien in the near future. 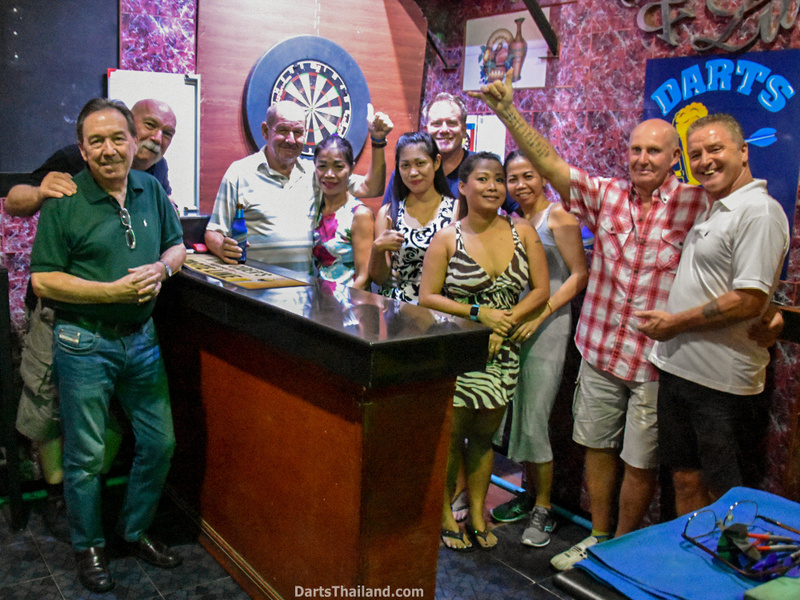 The ultimate goal of Darts Thailand is to visit every darts bar in Thailand and publish a report here. Ah – such a noble adventure & goal ! 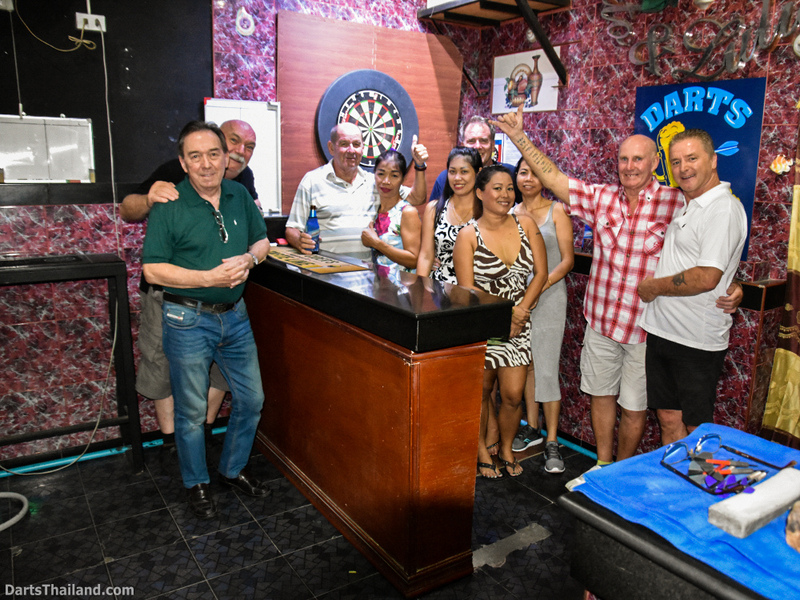 One More Point – We enjoy welcoming visiting darts players to Thai Darts Venues. – BUT REMEMBER – be sure to pack your darts in your “check baggage” and not your “carry on” baggage on any airline. 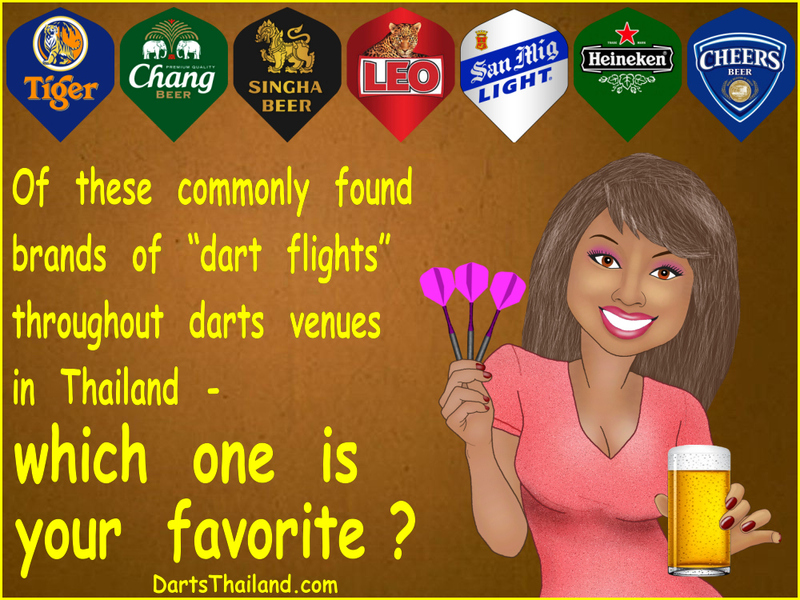 Just this past week – had a call asking where you can buy darts in Bangkok as a result of someone who forgot this rule.